Home Quilting Tutorials Give It a Drink & It Heals Itself? Cutting Mat Care! Give It a Drink & It Heals Itself? Cutting Mat Care! QUILTERS! LIKE YOU, It Needs Water! Quilters Cutting Mat Maintenance [Standard Distilled Water (Maybe) Mild Soap? Yes! Brush? Yes!, Vinegar? A little Yes!] Then wash the Dog? It likes room temperature, NO Sun, and Cool Water. If you live in the drier parts of the west or during the dry winter months, you might have to give your cutting mat a big drink! Details of things you can do to keep your self healing cutting mat healthy can be found by watching the 3 videos on the following pages. Yep, they need care too, because they aren’t cheap! I accidentally ironed a corner of mine and it warped. Will putting it out in the sun fix that also? Maybe, But I would try to warm it up first indirectly with a some steam. While its still warm use some rigid material, like plywood, and place it between two pieces. Stack something heavy on it. If possible try placing a damp towel on both sides directly on the mat, but use plastic wrap between the plywood and towel. The plywood will absorb the moisture from the towel if you don’t use a barrier of some kind. The mat needs time to absorb the water while it’s flat. A little warm air might help from a hairdryer, but don’t over do it. Just a suggestion. However! It might be easier to just get another mat and or cut the offending warped section off. Hope this helps! I have one of those!!!! Tried it with mine. It was clean but didnt help cuts in it. I guess it was too far gone. On the flip side I cut the material how do you repair that I have about a three inch gash? Dawna Hughes see this is what I was taking about! Thanks for sharing this. I may wipe it down tonight. ought to do this before Friday. Doris Merritt?? Have you heard this? Good to know. All I have ever done is wipe it clean. I do use a lint roller frequently to remove small scraps and thread. We are so glad we could help keep you informed! Good to know this!!!! We could give our cutting mats New Life!!! Me either and my hubby too !!! I tried this but mine is cut thru in a couple of places…it did not work for me.I soaked it just like you said to. If my cutting mat wants a drink, it has to wait until it is 21. Thank you for this information. I was not aware of this. Have had My mat for years. Never knew this. Good information to know. Time for a mat bath. Mine is badly warped in one spot. My SIL left the iron on it and didn’t realize it was going to do that. Not a problem here in the humid South. Our cutting mats, along with our skin, stay soft and supple! Think sauna! Does it want white or red? Cuz I’m having wine. Shirley Reisig Thomas, did you know about this? What’s your thoughts? Didn’t know. Will research this. Nancy Galinat have you tried this? Any thoughts on this, local quilters? New to me! Nice to know after all of these years. That’s great! Never thought of that. I had not heard of this Linda, thanks for the tip. Thanks for sharing Paula !!!!! Mine was getting hard !!! Read the text for re-hydrating instructions. Who knew?! Carol Young did you know this? I don’t think mine had care instructions either. They won’t of course give you care instructions they want you to buy new ones. Try a hair dryer not too hot to warm it up, then lay it flat put something flat and heavy on top. I used cookie sheet pans with other stuff on top, for weight. Then you will have to give it a bath once it’s flat again to replace the moisture. It was Pretty much the same thing they had in the article. I have had the same one for a very long time. The only care instructions I remember are to make sure to store flat and keep out of the heat. Thanks for the tip! I love my mat! I had a warped mat that I laid on the sidewalk in the sun, and it flattened without damage. What did I have to lose? Good luck finding Dove dish soap. I haven’t been able to find it anywhere. Very interesting. I didn’t know this. Thanks for sharing. no idea what that pink/thin thing in the pic is, and I watched 3 videos..none of which show anyone dunking the ‘green’ self healing cutting mat they and I have. The pink thing in the picture is a piece of pink fabric being cut, with a measuring template on top of it. I’ve had my cutting mat for about 20 years. Have never watered it. What should I look for that is not a good thing? Never heard of athing like water your matt. I never knew that either….I have been quilting for years and years…..
Great info! Thx for sharing this Beverly Beal-Spencer. Thanks Gail, I’m interested in them! Thank you so much for this. I’ll perform this maintenance on my mats this week. Never heard of this before, and my directions have never mentioned to do this. Check this out @[100000196388732:2048:Mary Redrick]. They should include a sheet on mat care when they sell them. What is the purpose of the vinegar? No mention of why. Its true. An Olfa rep told me at a show that the mats get dehydrated and need a bath every now and then. He said to soak it in a few inches of cool water in a bathtub then lay it flat. It would be a lot faster and easier to understand if they would just list the steps. the video didn’t say anything about water. Olfa told me this is an urban legend and to just use a gum rubber eraser to get the fibers out. I need a new one . @[736685785:2048:Rita Shields], check this out! 3 short videos: note use of rubber eraser to pull out lint in #1 & giving mats a bath in #2. Did they know this 10 years ago when they sold these? Can’t wait to clean my mat. I’ve got to get a mushroom brush. My mats need to be cleaned. Don’t waste money on a cleaner.. Use very fine sandpaper or sanding pad and swirl it very lightly..do not apply pressure. The fiber will roll into wads and no eraser dust involved. In a pinch, an emory board held flat will work. I did this – it didn’t make any difference at all. 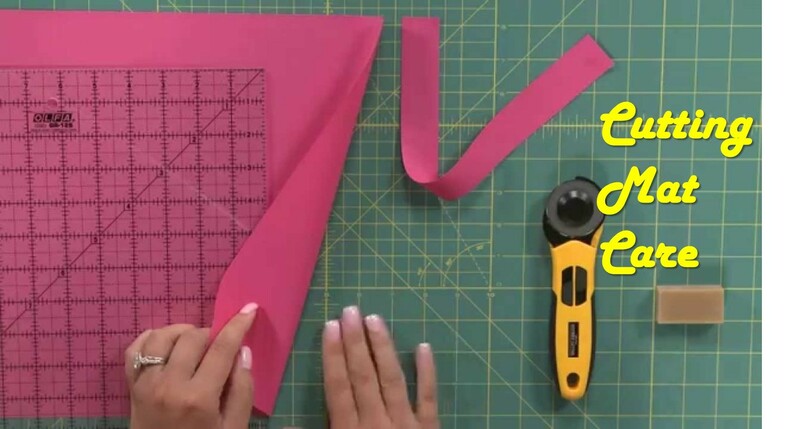 great tutorial-and I should have known and the eraser is great help-I have just finished cutting batting and have that fiber stuck in the lines and I will lay them flat from now on! It might be too far gone – or need a good long soak. Great way to save money Since they are sew expensive. Do not put the iron on it. And DON’T leave it in a hot car. Even if it is laying flat. This I know. Is there any way to re-flatten a mat that has been damaged by heat? I’m one of those that wipe my mat with a damp cloth after each use & have never had an issue with deep cuts etc – I thought the material it was comprised it was pretty much self healing in nature. I use to have a couple of these I used a lot sure wished I had them back.. If you don’t want to take time to watch the video, here’s the way to clean your mat & give it a “drink.” Fill your bathtub with room temperature water (not hot, not warm, and not cold) In the water add 1/4 cup of white vinegar and a squirt of dove dish soap for a good lather. Use a mushroom brush (soft bristle brush) and scrub the mat gently getting a good lather with the soap. Then rinse your self healing mat with cool water getting all residue off the mat. You can dry it with a cotton towel, or air dry. It doesn’t matter how you choose to dry it. But lay if flat after you’ve dried it. The reason for this method is the materials that makes your mat self healing absorbs water and makes the mat supple again. Water and the pliable rubber like material bond together. Not only does this make your mat last longer, but it keeps your blades from dulling so quickly because you are cutting into a softer surface. Makes sense right? I soaked my old one in the tub in warm water. The next time I used it-it snapped right in half….. I did not know this, and I’ve been using them for years. All of mine are getting a bath today. @[2335876:2048:Mandy Fisher]. I did this with your cutting mat using the vinegar and Dawn dish soap and it worked great!! They should have to tell you when you PURCHASE one that it will warp. I bought an OLFA , the biggest one, and put it in the rear of my SUV, went straight home and it had warped. NEVER GOT TO USE IT. BIG BUCKS WASTED. I contacted the company and never got a response. I avoid OLFA products. There are lots of others that have great customer service. I have a LARGE mat and didn’t have a vessel large enough to lay it flat, submerged, so sprayed the printed side with water, let it set for awhile, sprayed again, waited. Then followed the cleaning steps in the video. Made a noticeable difference. The water made the fibers swell, making it easier to remove them from the scratches. I washed mine twice and it still is bad and dulls my rotary cutter very quickly so I gave up and bought a new one. Trying to decide how I could use the old one. Maybe as a liner in the bottom of a diaper bag? That was a great idea!! I decided to use the back side as it didn’t seem to make any difference on the top side. Will not heal itself when cut all the way thru. That baby has been used. The things you learn. Did not know this about my self healing cutting mat. Does anyone know an answer to my problem that I previously posted about a warped mat??? Yes take and put your mat on a sidewalk or driveway that is flat and make sure sun is out. The heat will flatten it out. I did mine and it worked great. I forgot to say keep watch on it so it doesn’t get to hot, because that’s what you don’t want to do. I laid my under some heavy books. It took awhile. I just spread the books out enough to cover the surface. Or put under a heavy piece of furniture. Just so it lays under something heavy. Mine was curled up at one end from being shoved in the closet. My son moved some things and didn’t put them back correctly. I had to work it it a little by hand before putting it under the books. Have you checked with manufacturer? Try dampening it first maybe with a spray bottle so its not fragile, it would be able to move back to shape. From what I’ve been reading in these comments. Good luck! One of my mats has a sticky residue from spray mount. I originally got it for card making, hence I now have a second mat. Any ideas how to get it off though? Thanks for sharing ! Info I can use !